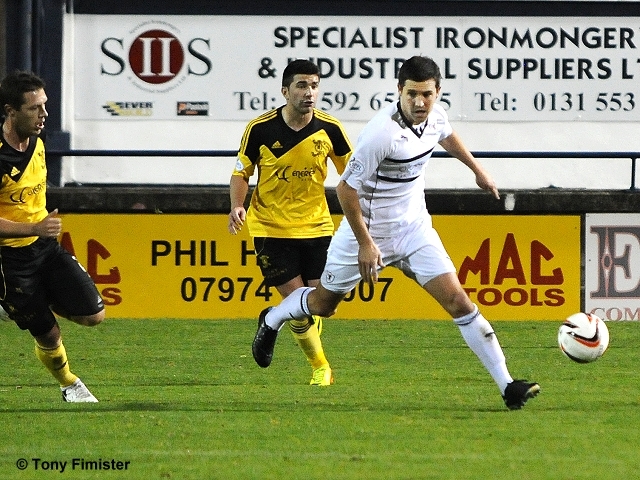 Raith Rovers leapfrogged Dundee into second place in the SPFL Championship following a narrow 1-0 victory against Livingston at Stark’s Park this evening. 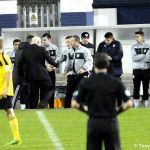 On a bitterly cold evening, Rovers fans extended a hearty welcome prior to kick-off to former manager John McGlynn, who took up his place in the away dugout. For Rovers, Ross Laidlaw took the place of the injured David McGurn in goal, and Gordon Smith, who scored the injury-time winner against Morton at weekend, was preferred in attack to Greig Spence, who was dropped to the bench. Laurie Ellis retained his place at the heart of the defence at the expense of the returning Dougie Hill. 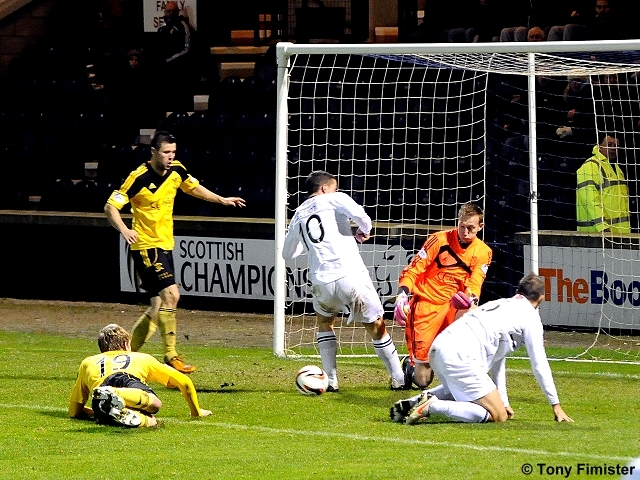 The home side started briskly, forcing Livingston to defend deep inside their own half. 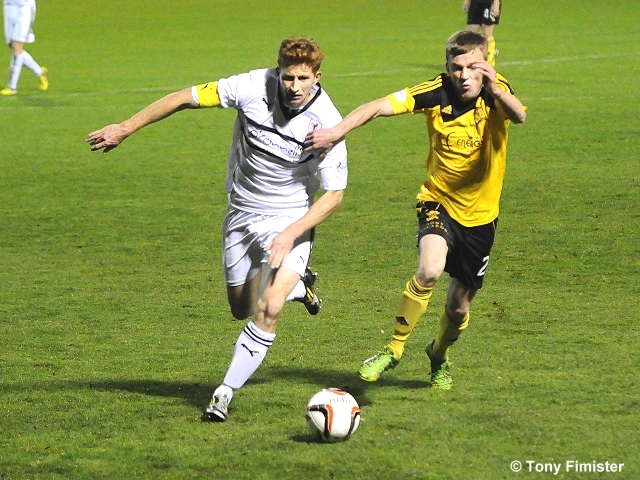 Joe Cardle was at the heart of several moves down the left wing, looking to create openings at every opportunity. 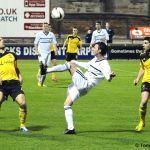 With little over five minutes played, the Rovers winger picked the ball up out wide on the left, and fired a low shot narrowly wide of Livi keeper Darren Jamieson’s far post. 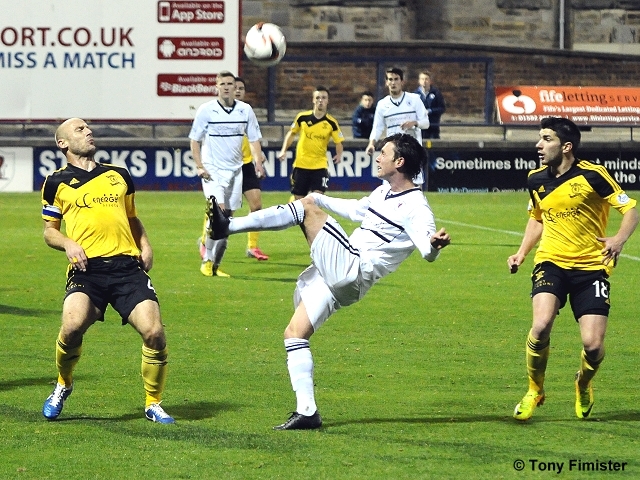 Callum Booth tried his luck in similar fashion shortly afterwards, though his shot also failed to trouble the target. 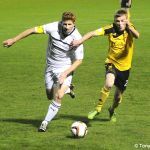 The match began to adhere to a pattern of Rovers dominating possession and territorial advantage, although the Lions looked dangerous on the break. 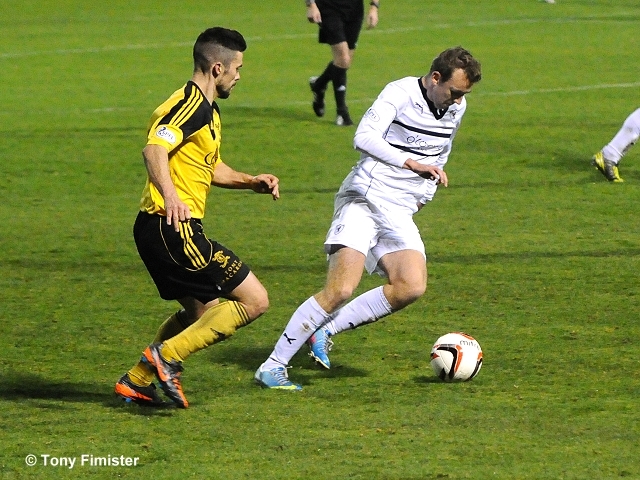 With twenty minute son the clock, determined play by Grant Anderson forced Rovers’ first corner kick of the match. 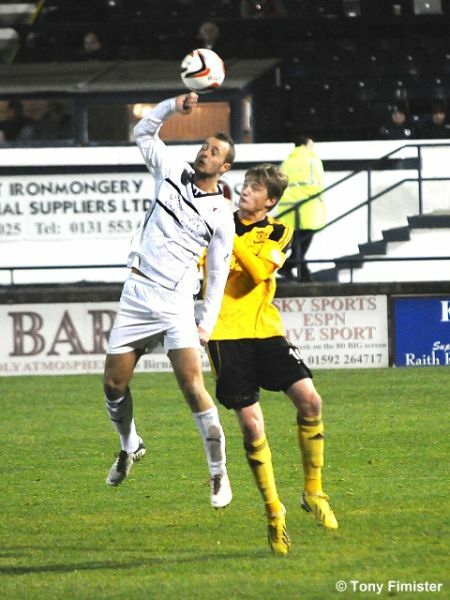 Cardle’s cross was met by Calum Elliot, whose firm downward header was somehow deflected over the crossbar by Jamieson. 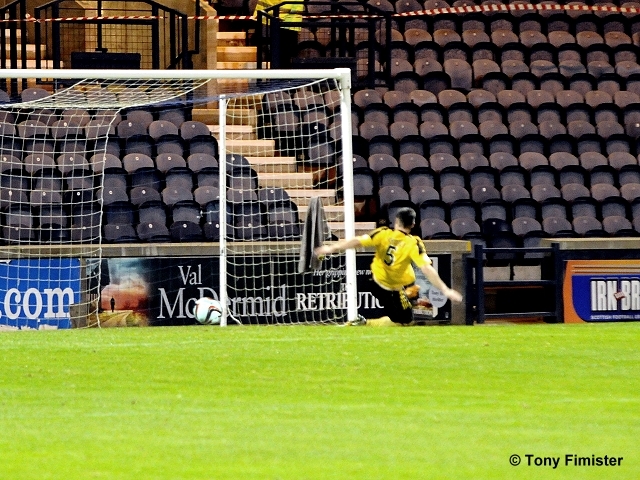 Rovers, however, only had to wait two more minutes before opening the scoring. 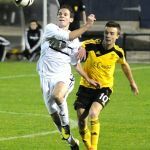 Gordon Smith did well to chase down a long pass deep into the Livi defence, and as Jamieson hesitated at the edge of his 18 yard box, the Rovers striker won the ball before driving it low into the net from an acute angle. Spurred on by the goal, Rovers continued to probe in a bid to extend their lead, with Cardle and Booth causing Livingston no end of problems with neat passing movements down the left flank. 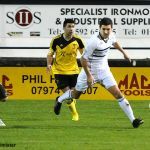 Although goalscoring opportunities were restricted to mainly longer distance, Jamieson did well to keep out efforts from both Rovers players as the first half neared its end. As the fans’ thoughts turned to a warming cup of Bovril at the interval, the game burst into life. 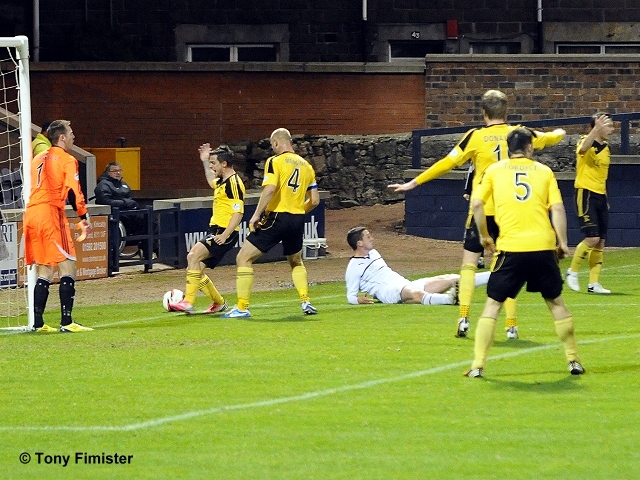 Smith found himself through on Jamieson, although the goalkeeper produced a fine blocking save to deny the striker. 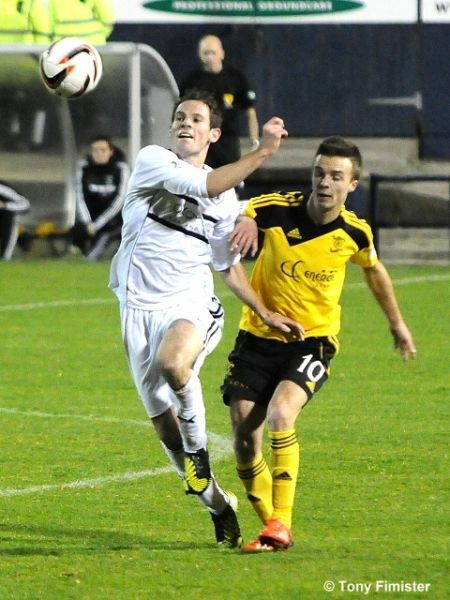 However, the loose ball was then picked up by Elliot, who was sent crashing to the deck as he bore down on goal. 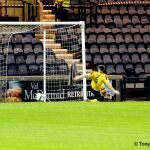 Referee Alan Muir pointed to the spot, but Elliot’s shot was too close to Jamieson who was able to make a comfortable save. The small band of fans who had made the trip through from West Lothian were still celebrating the penalty miss when their side was reduced to ten men. 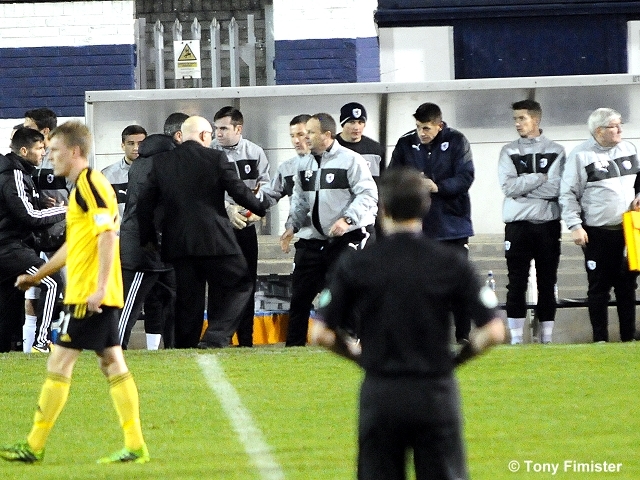 Danny Denholm was shown a red card for a reckless challenge on Anderson out on the right touchline. The midfielder protested his innocence, although neither his team-mates nor his manager appeared to offer much sympathy as he made his way to the dressing-room. Booth then came close to doubling Rovers’ lead with the final action of an entertaining first half, a rasping shot which Jamieson did well to parry to safety. Rovers emerged for the second period with the clear intention of giving themselves breathing space against stubborn opponents, possibly mindful of their own commendable efforts in snatching a draw in similar circumstances at Hamilton only a fortnight before. However, despite applying pressure and creating a number of opportunities, a second decisive goal eluded them. A header by the impressive Paul Watson flew over the bar, and then good work by Jason Thomson and former Livi player Liam Fox led to a chance for Elliot, whose shot was smothered at point blank range by Jamieson. Kevin Moon then squandered an opportunity from a neat cut-back by Ellis, his shot from a promising position in front of goal flying high into the home stand. Rovers striker Smith was cautioned for handball, as the home fans began to betray their anxiety over the narrow single goal advantage. This in turn appeared to affect the players, who struggled to find any cohesion to their play as the second half wore on. 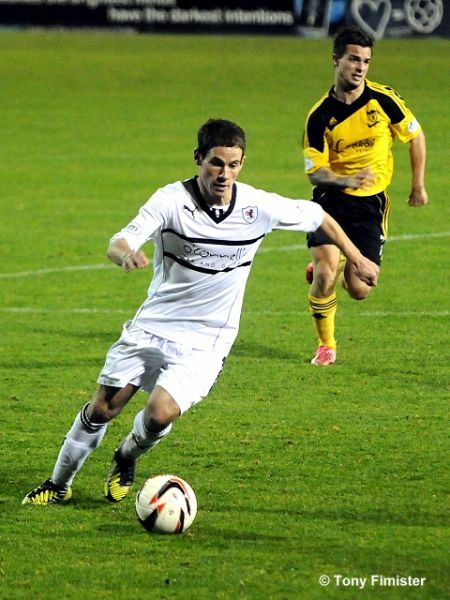 Rovers boss Grant Murray replaced the tiring Smith with Greig Spence in a bid to find the elusive second goal. 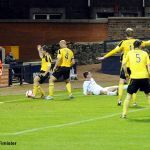 Perhaps encouraged by the home side’s discomfort, Livingston began to push forward, and the Rovers defence was forced into several rather hurried clearances. Stefan Scougall then found his way into the referee’s book for a crude challenge on Fox as the match entered its closing stages. As the home fans anxiously glanced at their watches, Anderson made way for Ross Callachan, as Grant Murray sought to close out the match. Livingston did have the ball in the net following a scramble in the Rovers box, but the whistle had already been sounded or a foul. Shortly afterwards, the sound of the final whistle was met with cheers of joy and no little relief by the Rovers faithful. 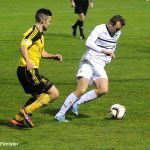 Despite creating a number of chances during the match, Rovers were forced to cling on desperately for a win which leaves them just two points shy of league leaders Hamilton. As the fans spilled out into the cold night air, news came through that Rangers would be Rovers’ opponents in the Ramsden’s Cup final next spring. 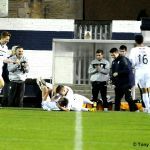 With a cup final to look forward to, and a promising league position suggesting a promotion push might be in the offing, the positive vibe installed by the recent run of favourable results continues to attach itself to those of a Raith Rovers persuasion. Outstanding goal from SMITH! 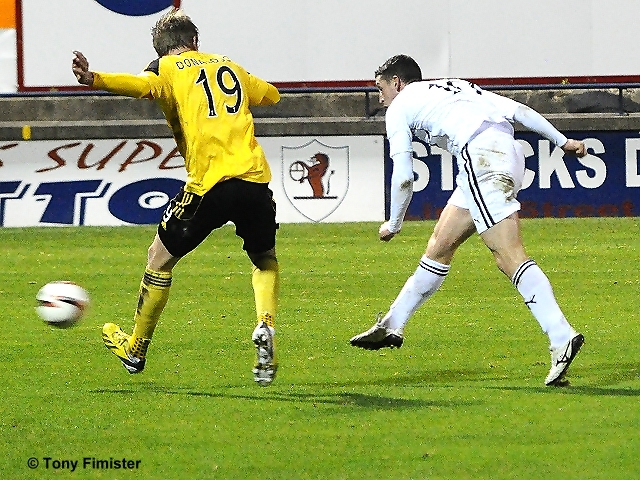 He goes in for a loose ball with the Livi keeper, wins it, then rifles it home from a narrow angle! Cardle shoots straight at the keeper - the game's really come to life now! 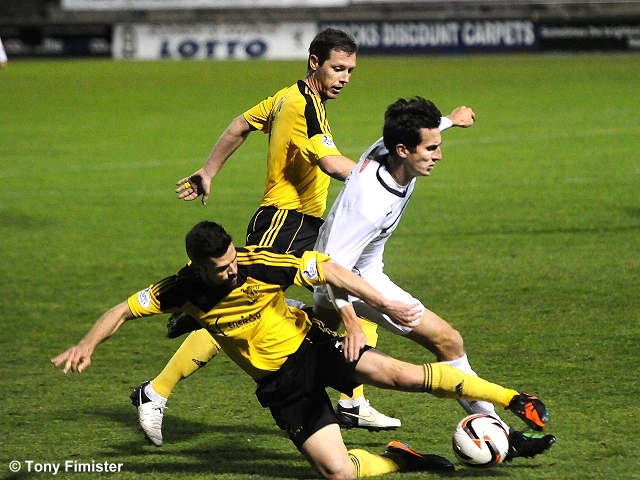 Scougall stretches every sinew in his neck but can only put his header straight in the air. Far too much space for him there. Comfortable half by and large. The penalty was a bit of a surprise, the linesman gave it, but the red card was a no-brainer. Red card foul was on Anderson, not Elliot. I was busy typing about the penalty incident and got tied in knots! Livi sub: Scott on for, erm, someone! Wearing number 18, but not listed on my team sheet! 1 Ross Laidlaw managed a clean sheet. 3 Joe Cardle building another attack. 5 Fordyce can't stop Smiths shot hitting the net. 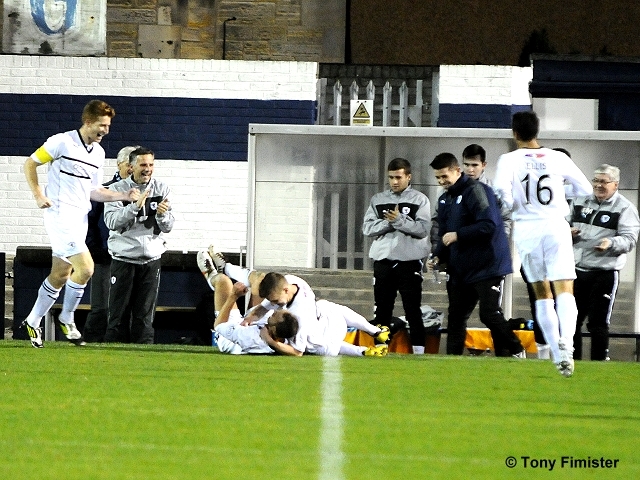 6 Gordon Smith celebrates with Calum . 7 Mensing and Cardle in the box . 9 Elliot goes down in the box PENALTY . 10 Goal scorer Gordon Smith. 13 Elliot tries a shot at the Livi goal. 14 Gordons Hand of God moment . 15 Calum couldn't sink the follow up. 16 Kevin Moon and Stefan Scougall . 18 Grant Anderson goes down in the tackle. 20 Hand shakes all round at the final whistle.